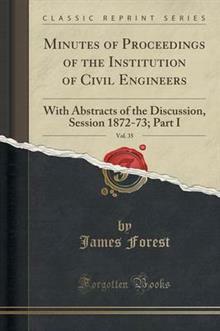 Excerpt from Minutes of Proceedings of the Institution of Civil Engineers, Vol. 35: With Abstracts of the Discussion, Session 1872-73; Part I Professor Abel said he had endeavoured to give a general account of the nature and characteristics of the several classes of explosive age... read full description below. Excerpt from Minutes of Proceedings of the Institution of Civil Engineers, Vol. 35: With Abstracts of the Discussion, Session 1872-73; Part I Professor Abel said he had endeavoured to give a general account of the nature and characteristics of the several classes of explosive agents produced, and to a more or less extent used, as substitutes for gunpowder in industrial operations, and he trusted the discussion of the Paper would serve to elicit information, with regard to their use and relative merits, from persons practically acquainted with their employment. He had pointed out certain defects of gunpowder, some of which, he believed, were fully established, while others might be open to question. Amongst these were, the variation in its composition and preparation, and consequent want of uniformity in its action. Its deterioration by the absorption of moisture was due to the fact that it was made with special regard to cheapness. About the Publisher Forgotten Books publishes hundreds of thousands of rare and classic books. Find more at www.forgottenbooks.com This book is a reproduction of an important historical work. Forgotten Books uses state-of-the-art technology to digitally reconstruct the work, preserving the original format whilst repairing imperfections present in the aged copy. In rare cases, an imperfection in the original, such as a blemish or missing page, may be replicated in our edition. We do, however, repair the vast majority of imperfections successfully; any imperfections that remain are intentionally left to preserve the state of such historical works.